In this issue we present a very interesting paper by two entomologists of South India. The paper deserves special attention primarily because of its ecological approach to sericulture and entomological perspective to pest insects. Even though the primary responsibility of an agricultural entomologist is to device means to eliminate insects designated crop pests and to protect those designated economically important; the ecological balance between the pest, other (neutral) insects and the crop environment deserve his/ her attention in a long term perspective. This paper is notable at a time when such studies (at least in Moriculture) are becoming increasingly rare. Dr. A. Mahima Santhi is a scientist with Central Silk Board, India. A post graduate in Agriculture from Tamil Nadu Agricultural University (TNAU), she earned her PhD in Agricultural Entomology from Manonmaniyum Sundaranar University, Thirunelveli, India. She holds more than eighteen years of research experience in sericulture and entomology under CSB. Currently she is heading the technical wing of Kerala State Sericulture Cooperative Federation (SERIFED) as its Deputy Director. Dr. S. Prasanna Kumar is Professor & Head, Department of Zoology and Dean of Sciences, Scott Christian College, Nagercoil, India. A PhD in Zoology, he has more than thirty years of research and teaching experience in Entomology. The perennial nature of mulberry combined with monocultural practices, harbours several pests throughout the year with seasonal variations (Rangaswamy et al., 1976). The production of appreciable quantity of quality mulberry leaf is often hampered by insect pests belonging to large number of insect orders. Apart from insect pests, predators, parasitoids, naturals and detrivores also survive on mulberry plant. Studies on diversity are the preliminary for any management work. . Narendran (2001) explained that taxonomy is the foundation of biodiversity. Hence a survey was conducted in mulberry ecosystem to survey the diversity of the insects. The taxonomic diversity of the insect communities was worked out in the mulberry ecosystem. Survey on the insect diversity was conducted at Nagercoil, South India for continuous two years. The details of materials and methods are described here. The mulberry garden was divided into five sub plots, four at corner, and one at the centre. From each sub plots ten plants were selected at random for the observations. Thus 50 plants were observed every fortnight for two years. The number of mealy bugs, grasshoppers, scales, whiteflies, thrips, leafhoppers, bugs etc., feeding on the plants were counted. The total number of predators and parasitoids present on each selected plant were counted. Ants attending mealy bug populations were also recorded. Other insects such as butterflies, cockroaches present on the plant at the time of observation were also recorded. The soil insects such as carabids, termites were counted around the selected plants using Berlese funnel method. 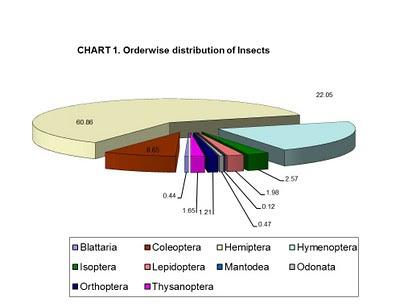 The average of the counted insects per ten plants was treated as one sample. The insects were collected, observed and unknown insects were preserved for identification according to Schauff (2002). The insects of various orders of class Insecta were distinguished. It was the largest hemimetabolous orders with piercing and sucking mouthparts, with two sub orders, Homoptera and Heteroptera. Insects from both suborders were observed in the field. Insects which do not possess scutellum and has uniform leathery forewings are homopterans. Insects observed from this orders were herbivores. Important ones are detailed below. Pseudococcids, generally called mealy bugs were the dominant insects. Their body was covered by mealy coating. Eggs were laid in loose cottony sac. Young ones were gregarious. Female were wingless and males winged. These mealy bugs secreted honey dew hence attended by ants. These ants protected mealy bugs from natural enemies. In the present study three species of mealy bugs were observed in the field. The mealy bugs recorded were. These mealy bugs were present throughout the year except rainy months followed by winter season. The population was low during rainy season. The mealy bugs prefered tender leaves and twigs. Continuous feeding by mealybugs caused severe tukra symptoms. The tailed mealy bug, which is a polyphagous pest, also infested young mulberry leaves. Their occurrence was very meagre to show any visible symptom, in few cases young shoots tips dried due to continuous feeding. This was a serious pest found almost in all the months in the second year and summer months in the first year. Young ones fed on tender leaves and caused curling of leaves but not clustered like tukra. The grown up ones were seen feeding on the nodes and uniformly distributed throughout the stem. On continuous feeding the leaves become yellow and withered off. When there was severe feeding the terminal bud was killed which caused the sprouting of ancillary bud. Severe damage made the stem to dry. The mealy bugs were attended by black ant, Camponotus compressus. Recently papaya mealy bug incidence was noticed on mulberry crop in western parts of Tamil Nadu and Palghat district of Kerala. The papaya mealy bug is found on leaves, stem and twigs. Adult females are yellowish with short waxy filaments around the margin. The dispersal stage is the first instar crawler. The mealy bug injects a toxin as it feeds on leaves, which results in chlorosis (yellowing), stunting, deformation, early leaf drop, and buildup of honeydew. Sooty mould growing on honeydew excreted by the mealy bugs interferes with photosynthesis. Heavy mealy bug infestation kills the plants. The insect Icerya aegyptiaca was seen feeding from undersurface of the leaves. These insects were seen in groups or single. These bugs were bigger in size and orange coloured with black legs. The body was covered with white mealy waxy strands. Eventhough the pest was seen in majority of the months, the damage symptom was not serious. The population was higher during summer months. Aleurodicus dispersus, the white fly were minute active whitish insects resembling tiny moths. The body and wings were covered with white powdery coating. The eggs were laid in irregular spirals. The white nymphs and adults were seen on lower surface of leaves. The desapping of leaves depleted the nutritive value of leaves. The incidence was noted from late January to early April. The cow bugs Oxyrachis tarandus were seen feeding on tender shoots. The nymphs were attended by ants. Their occurrence was very meagre. Small specks were seen at the feeding site. The black scales, Saissetia nigra were seen on stem and on lower side of the leaves. The occurrence was noted from January month to May. No severe damage noticed. The leaf hopper, Empoasca flavescens, adults, and nymphs fed on tender leaves and caused “hopper burn” symptoms. They were very active and jump, can move sideways. The incidence was noted during July to October months. The insect population was very low to cause economic injury. The shield bug, Scutellera nobilis was seen very rarely on mulberry and did not cause much damage. The assassin bug, Eirantha armipes were seen during rainy months June-July. This was an effective predator. Beneficial interaction existed between the mealy bug and ants. 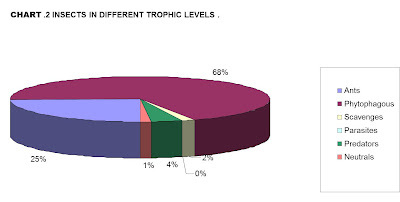 The dominant M. hirsutus population was heavily influenced by ant population. The predator population in the ant attended colonies was significantly lower. Ants were seen attending mealy bug colonies. The mud dauber wasp, Ammophila procera were seen very rarely on mulberry leaves. The females hunt for arthropod prey which serves as food for their offspring. The small parasitoid, Leptomastix dactylopii was rarely seen in the garden. But the parasitized mummies of mealy bug were seen during non-rainy months. Coleopterans are the insects with biting and chewing mouth parts with hard exoskeleton. Forewings were hardy and hind wing membranous. The stem girdler, Sthenias gristator was seen during February month of the first year. The adult beetle girdled the young green branches of the mulberry plant and caused drying of the twig. The bark and wood up to the centre were cut by powerful mandibles and in few plants entire twig was cut into two bits. Ash weevil, Myllocerus discolor and M. viridanus were seen on mulberry leaves. The presence of this beetle was recorded throughout the year. Their occurrence was slightly higher during summer months. Damage symptoms were not severe. The dung beetles or dung rollers, Scarabaeus sp were seen on the soil during summer months. They produced dung balls for egg laying. They are grouped under scavengers. The ground beetle Carabus nemoralis were found throughout the year in the soil. The beetles were mainly predators. Two predatory beetles were recorded. Nephus regularis (Sic.) was the common predominant predator seen feeding on mealy bugs. They were seen inside the tukra curls. The grubs were black coloured with white mealy coating seen inside the tukra curls feeding on mealy bugs. Adults were very small oval shaped brown coloured beetles. The population of this beetle increased with increase in mealy bug population. The activity of beetles was not seen on tukra affected branches with ants. Another yellow lady bird beetle recorded was Illeis cincta. The yellow coloured grubs and adults were seen on plants feeding on powdery mildew growth on leaves. Their occurrence was higher during winter months. Small insect with rasping and sucking mouth parts. The thrips, Pseudodentrothrips mori injured the epidermal tissues of leaves and desapped Leaves showed streaks in the early stages and blotches in the later stages. Leaves became brittle and were unsuitable for feeding silkworms. In severe case of attack leaves whither and dried. The attack was seen during May and June of the first year. The second attack was during December to February. Then the attack was repeated during May and June in the second year. Medium sized insects with mandibulate mouthparts, the hindlegs are enlarged facilitating jumping. The short horned grasshopper Neoorthacris nilgriensis or wingless grasshopper was present throughout the year. The population showed slight increase during summer months when other plants dried without irrigation. The insect had shorter antennae and ovipositor. The wings were not present. Other insects of this order, long horned grasshopper, Tettigonia viridisima of Tettigonidae and field cricket, Gryllus sp. of Gryllidae were also present in the garden. Soft bodied, social and polymorphic winged species living in large colonies, with biting mouth parts. The termites Odontotermes sp. feed upon roots and barks of young and old plants. Severe attack leads to death of plant. These termites build colony structure and live socially with workers, soldiers and queen. The presence of termite was higher during summer months. Lepidopterans are holometabolous insects, adults brightly coloured, winged insect with long tubular suctorial mouthparts. The larvae are soft bodied caterpillars with biting mouth parts. The pupae are generally enclosed in a cocoon. Diaphania pulverulentalis, the leaf roller of mulberry, incidence were recorded during September and October months. The larvae damaged by folding the leaves and by webbing the tender shoots. Early instars fed from inside the web and skeletonize the leaves. Later instars fed the tender leaves voraciously. Larval feeding caused qualitative and quantitative loss of leaves. Other insects of Lepidoptera present were Eurema hecabe of Pieridae, Catochrysops cnejus of Lycaenidae and Danaus plexippus of Danaidae. They were neither harmful nor useful to mulberry. The dragonfly, Libellula quadrimaculata of Libellulidae and Damselfly, Protoneura sp of family Protoneuridae were commonly seen in the mulberry leaves. These insects were general predators. The preying mantis, Mantis religiosa of family Mantidae was recorded. They were effective general predators. The field cockroach Blattella sp of family Blattellidae were seen scavenging on mulberry plants. The insects occupied the tukra curls for shelter. The order Hemiptera was the prominent order. Around 60 to 62 per cent of insects belonged to order Hemiptera. Under Hemiptera order, six homopterans and two heteropterans were recorded. The family Pseudococcidae with four species of mealy bug was the largest family recorded. Next homopteran recorded in the garden was whitefly. Hymenoptera was the second dominant order in the garden. Ants were found in association with the homopterans. There was a beneficial interaction between homopterans and ants. The parasitoid of mealy bug Leptomastix dactylopii was also recorded under this order. These insects were used in bio control programmes often in mealy bugs. (Noyes and Hayat, 1988). The order Coleoptera was the third largest order in the garden. The coccinelids were dominant and seen throughout the year. They were effective predators of soft bodied insects and also feed on fungal growth such as powdery mildew. This was also reported by Joshi et al., (2003). The carabids were found next to coccinellids in the field. Allen (1979) reported carabids as beneficial insects. Insects of Isoptera, Lepidoptera, Dictyoptera, Odonata, Orthoptera and Thysanoptera were found in mulberry ecosystem. Among these insect orders, Odontotermes obesus of Isoptera, Diaphania pulverulentalis of Lepidoptera and Pseudodentrothrips mori of Thysanoptera were serious pests of mulberry ( Sathya prasad et al., 2000 and Dandin et al., 2001). The trophic interaction between plants, herbivores, natural enemies and others were studied in the mulberry field and detailed in chart.2. In the present study 68 per cent of phytophagous, 4 per cent of predators, 25 per cent of ants, 1.5 per cent of scavengers, and 1.5 per cent of neutrals were recorded. These studies should be done in all mulberry ecosystems. The natural enemies should be preserved in the garden. The balance between phytophagous insects, natural enemies, detrivores, and neutrals should be maintained for a successful mulberry crop. Ambrose, D.P. 2004. The insects, structure, function, and Biodiversity. Kalyani publishers, Chennai. 821 p.
Dandin, S.B., Jayaswal, J. and Giridhar, K. 2001. Hand book of Sericulture technologies. Central silk board, Bangalore, 287p. Joshi, S., Mohanraj, P., Rabindra, R.J. and Rao, N.S. 2003. Production and use of coccinellid predators. Project Directorate of Biological control, Bangalore, India Bull. 32, 26 p.
Narendran, T.C. 2001. Taxonomic Entomology, Research and Education in India. Curr. Sci., 81 (5): 445-447. Noyes, J.S and Hayat, M. 1998. Oriental mealy bug parasitoids of the Anagyrini (Hymenoptera: Encyrtidae). CAB International, 551p. Rangaswamy, G., Narasimhanna, M.N., Kasiviswanathan, K., Sastry, C.R. and Jolly, M.S. 1976. Sericultural Manual, Mulberry cultivation, FAO., Rome,150p. Schauff, (2000). Collecting and preserving insects and mites, techniques & Tools, Systematic Entomology laboratory, USDA, Washington. 66p. Wonderful paper. Very nicely explained and presented. Keep it up.